Sensa by Cosentino granites are virtually maintenance-free; they are easy to clean and the treatment has a 15-year warranty.To clean your countertop, wipe with soap and warm water or a mild household cleanser.Wipe up spills as soon as possible. Always avoid using bleach and abrasive cleaners. Do not use polishes or waxes. 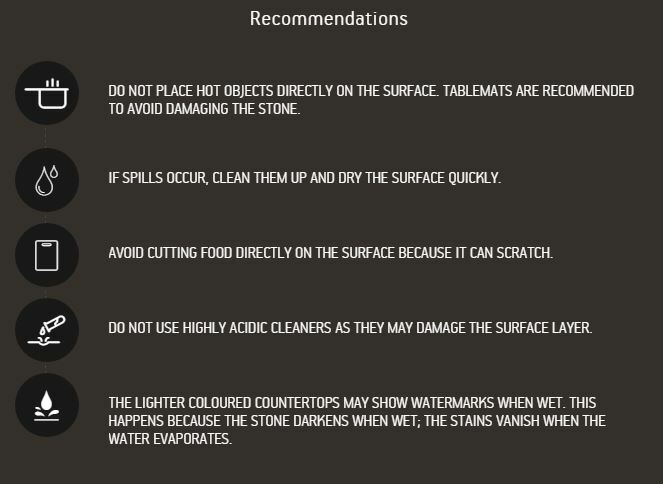 You need not apply any treatment to protect your Sensa by Cosentino® countertop. Like any other natural stone, granite is sensitive to thermal shock, i.e. sudden surface temperature changes. We recommend you use tablemats to protect the countertop from direct heat. Sensa by Cosentino granites have a patented treatment that is used to provide high stain resistance. The protection ensures that your Sensa by Cosentino® countertop will stay beautiful for years with minimal maintenance. Clean the countertop regularly with a nonabrasive bleach-free cleaner to ensure your Sensa by Cosentino® countertop remains as good as new. Stonemasons working with Sensa by Cosentino must take into account certain considerations and precautions when deciding the location of the joins, such as (among others) the customer’s wishes, the layout of the kitchen, the environmental conditions, safety measures, the resistance of the materials and structure of the cupboards.